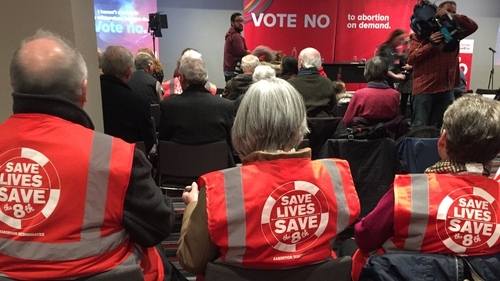 The Save the 8th campaign has been launched in Dublin ahead of May’s referendum on the Eighth Amendment. The group is campaigning for a No vote and its leader Niamh Uí Bhriain described a Yes vote as a "horrible and tragic mistake". She said politicians are asking people to trust them and are "effectively seeking a licence to kill". "The public cannot trust politicians with the right to life in the womb," she said, adding that "there have been more flip-flops in the Dáil than on the average beach". Ms Uí Bhrian said Tánaiste Simon Coveney has had "four distinct positions on abortion". Also speaking at the launch, Dr John Monaghan, a consultant obstetrician, said he believes there is "no medical evidence to get rid of the Eighth Amendment". He said he had delivered between 4,000 and 5,000 babies during his career and had never been prevented from protecting a woman’s life by the Eighth Amendment. Dr Monaghan said many doctors like him are pro-retain and he said others were giving "their personal views, not professional". Nurse Marie Donnelly said abortion was not healthcare and she would give up her career rather than take part in an abortion. She said the Government plan for abortion "will add an intolerable strain to an already broken service". Vicky Wall, a mother who lost her baby soon after birth, also spoke, saying "we are being asked to sanction every abortion in Ireland for people like me ... I for one and others will not stand by while our suffering is used to inflict death on perfectly healthy babies". Dr Eimear Thornton said as a mother-of-four she has "more experience" than Minister for Children Katherine Zappone and Taoiseach Leo Varadkar. She said abortion is a "multi-billion dollar industry" and "abortion is a licence to kill and that it why we must and will save the Eighth". The former Master of the National Maternity Hospital, Dr Peter Boylan, has said those who say you should not trust politicians are being "very anti-democratic." He said it is a typical approach used by the alt-right in the US. Speaking to RTÉ News following the launch of the Save the 8th campaign, Dr Boylan said "The Eighth Amendment has caused huge problems for the practice of obstetrics in Ireland, we've seen that with the long list of women whose lives have been deeply affected, to the point of death." The Government announced yesterday that the referendum will take place on Friday 25 May.